Usted Está Aqui (You Are Here): The Mapping Project, is a full-evening of performance created with visual artist Ilya Noe and choreographer Kristin Heavey (Element Dance Theater). 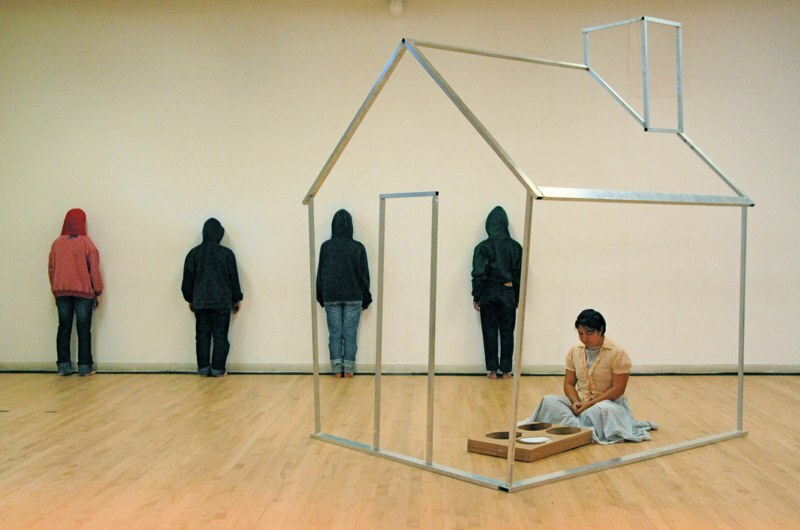 The work premiered at CounterPULSE Theater in May 2008, as part of the San Francisco International Arts Festival (SFIAF). A multimedia dance theater show that explores the human penchant for creating maps of our geographies and our histories, the work includes oral histories, dance, theater, sculptural stage design, and multimedia projections. Usted Está Aqui looks at the human penchant to create maps of our territories, bodies, and histories. We respond to Thai anthropologist Winichakul Thongchai’s premise that maps are not merely an objective representation of reality. Rather, they have often been used to illustrate the reality that colonizers wanted to impose on a territory and the people living there. The map creators were often successful at imposing their borders and categories, thus altering people's conceptions of themselves and their homes. As such, the project explores the ways in which map-making can drive our perceptions of world, and the ways in which we can create our own maps to change our realities. Supported by the San Francisco Arts Commission, Theatre Bay Area CA$H Grant, the Zellerbach Family Fund and the Lanier Family Fund.